Preheat oven to 180°C (350°F). Place the bread on 2 large baking trays, lightly brush with the oil and sprinkle each with chia and salt. Cook for 8 minutes or until crisp. Set aside. Heat a large frying pan over high heat, add the corn and cook for 4–5 minutes or until lightly charred. To make the jalapeño yoghurt, place the yoghurt, pickled jalapeños and salt in a bowl. Using a hand-held blender, blend until smooth. 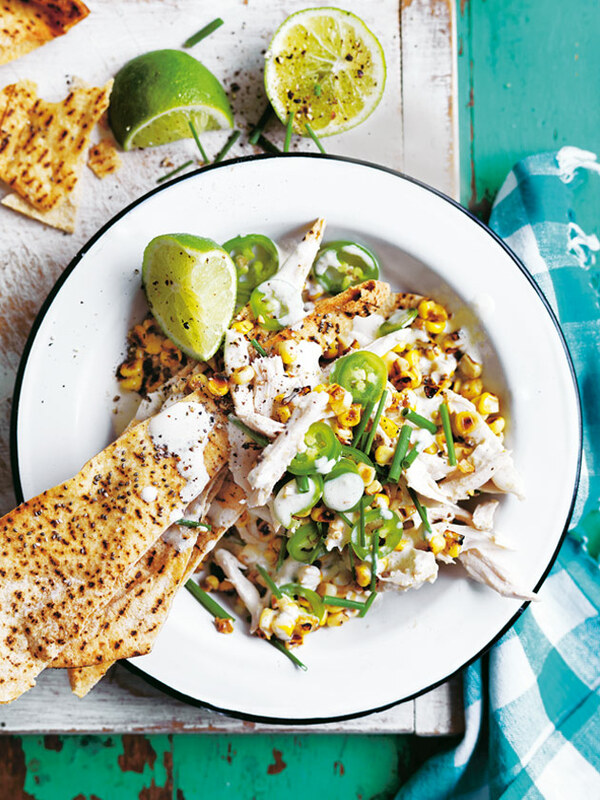 Place the chicken, corn and half the dressing in a bowl and toss to combine. Season with salt and pepper. Divide the Lebanese breads between bowls. Top with the chicken and corn mixture, chives, fresh chilli and remaining dressing. Serve with lime wedges. Serves 4.